Starting from the 22nd position in the unique, 150-lap, three segment event, Crafton worked his way inside the top-10, running eighth, when the third caution flag was displayed at lap 39 for a multi-truck accident in Turn 3, ending the first 40 lap segment. Crew chief Carl “Junior” Joiner brought the No. 88 Menards Toyota Tundra to pit road for the only pit stop of the night, for four tires, and fuel. Restarting eighth, for the second segment, at lap 42, Crafton maintained a position inside the top-five, running as high as fourth, when the seventh caution flag was displayed for the competition caution at lap 93, ending the second 50 lap segment. Complaining of a Toyota Tundra that was “super tight,” Crafton lost ground to the leaders on the restart, at lap 94, but maintained a position inside the top-10. Battling for every position on the race track through the ensuing 56 laps, Crafton finished 10th behind race winner Kyle Larson, his fourth top-10 finish in four starts at the half-mile clay oval. 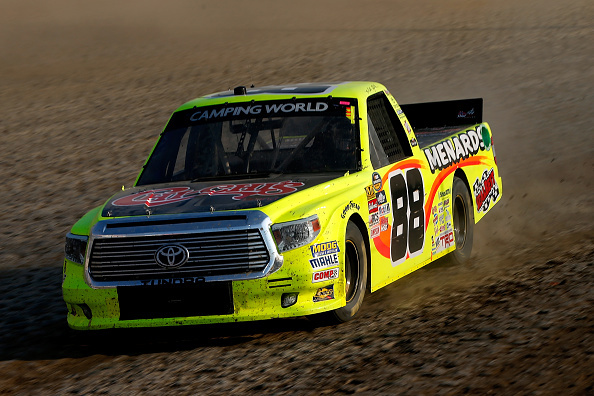 • The NASCAR Camping World Truck Series (NCWTS) had two practice sessions on Tuesday evening in preparation for Wednesday night’s Aspen Dental Eldora Dirt Derby at Eldora Speedway. Matt Crafton was sixth, and eighth, respectively, in both sessions. • The No. 88 Menards Toyota Tundra was 27th in single truck qualifying on Wednesday afternoon. • Crafton lined-up sixth in Qualifying Race No. 2, and finished fifth. • In four starts at Eldora Speedway, Crafton has four top-10 finishes. • In 11 starts in 2016, Crafton has one pole (Atlanta), two wins, and has led 394 laps en route to four top-five, and nine top-10 finishes. • Crafton remains second in the 2016 NCWTS driver point standings nine points behind leader, William Byron. • In 372 career NCWTS starts, Crafton has led 2083 laps en route to 12 poles, 13 wins, 93 top-five and 219 top-10 finishes. • Crafton’s ThorSport Racing teammates finished third (Abreu), seventh (Hayley), and 23rd (Rhodes). • Up Next: The Pocono Mountains 150 at Pocono Raceway on Saturday, July 30 at 1:00pm ET on FOX Sports 1, MRN, and SiriusXM NASCAR Channel 90.